General Information for The Eastern & Oriental Express. The train offers four categories of elegant private cabins : Pullman Single, Pullman, State Cabin and Presidential Suites. Most offer twin-sharing accommodation and are fully air-conditioned with en-suite shower and toilet. All are panelled with cherry wood and elm burr, with decorative marquetry friezes and intricate design inlays that enhance the fine fabrics and hand-tufted carpets. The Pullman cabins have upper and lower berths, while State Cabins and Presidential Suites offer two single beds. Pullman Singles offer one single bed. During the day, berths/single beds are converted into comfortable seating so guests can relax while admiring the breathtaking scenery unfolding before them. For further information see Accommodation. There are three sophisticated restaurant cars - "Adisorn", "Rosaline", and "Malaya" - two of which join the train for every journey. Each car is decorated in floral motifs reflecting the culture of the region. Gleaming elm panels have light wood design inlays or rosewood with decorative lacquered panels hand-painted with delicate flowers. Distinctive European cutlery and hand-cut crystal glassware add an additional stylish flourish, creating the perfect setting in which to savour the dishes created by the head chef. Breakfast and afternoon tea are served in cabins to allow guests to make the most of the idyllic scenery passing by. Evening dining offers guests an opportunity to dress up for the occasion with glamour and style. A jacket and tie are customary for gentlemen, with suitable evening wear for ladies. Smart day wear is appropriate for all other times. Most dietary requirements can be catered for - please advise us when booking. On the six-night journeys there will be a mix of formal evenings and more relaxed evenings where formal wear is not required. The six-night journeys also encourage guests to explore, so comfortable day wear is acceptable. 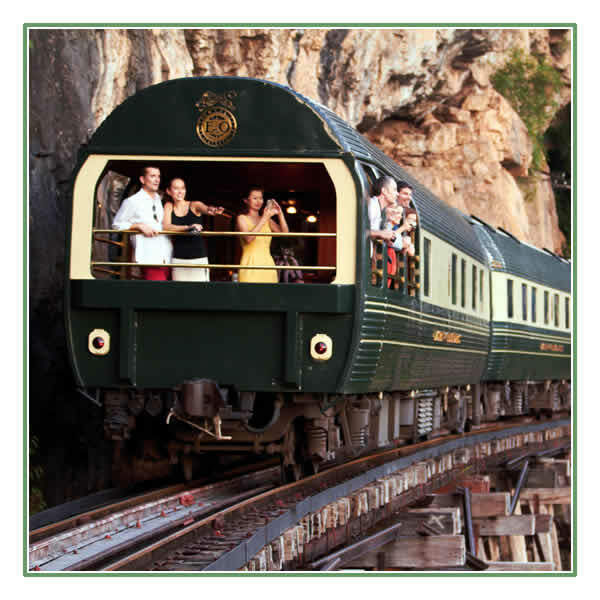 All sightseeing and excursions on your journeys are escorted throughout by qualified guides and are designed to provide the perfect balance of relaxation on board with the opportunity for interesting and fascinating experiences off the train. At the very end of the train with its own bar, this is the perfect place to enjoy cocktails amid a colonial "verandah" ambience with its teak-wood flooring and panelled walls. There is also an outdoor observation area to enjoy the panoramic views during daylight hours as the train journeys through South-East Asia. The reading room within the saloon car is a charming area offering a selection of books, magazines and games in a vintage setting with a traditional Chinese feel. The Signature boutique offers guests a wonderful selection of specially created gifts sourced in both Europe and Asia, which will give a lasting reminder of a truly memorable journey. Located in the centre of the train, the piano bar is open throughout the day and late into the night. With its pale ash-wood panelling and resident pianist, it is an intimate, convivial setting in which to relax over a cocktail or an aperitif with fellow guests. A variety of local performers provide live entertainment on board. Luggage is limited to 30 kilos per person for Pullman and State Compartment passengers. There is no limit for those passengers travelling in a Presidential Suite. Please keep your tickets, passports and any medication with you, do not pack them in your through or compartment luggage. • Through luggage: We suggest that items not required for your journey are packed separately in sturdy baggage. At check-in this luggage will be labelled appropriately by our staff and will not normally be accessible until you reach your destination. Ideally, large and/or hard cases should be checked as through luggage. • Compartment luggage: This should contain clothing and items you need during your journey. When you plan your luggage, please bear in mind that storage space is limited. There is a luggage rack plus an additional storage cupboard with hangers. One or two soft sided suit carriers or similar can be comfortably accommodated in each compartment. • Hand luggage: Your passport, tickets, jewellery, money, camera, fragile items and any medication should not be checked in. We advise that you take out insurance to cover the loss or damage to your luggage. Passengers should also be aware of luggage restrictions on any flights taken as part of their journey. 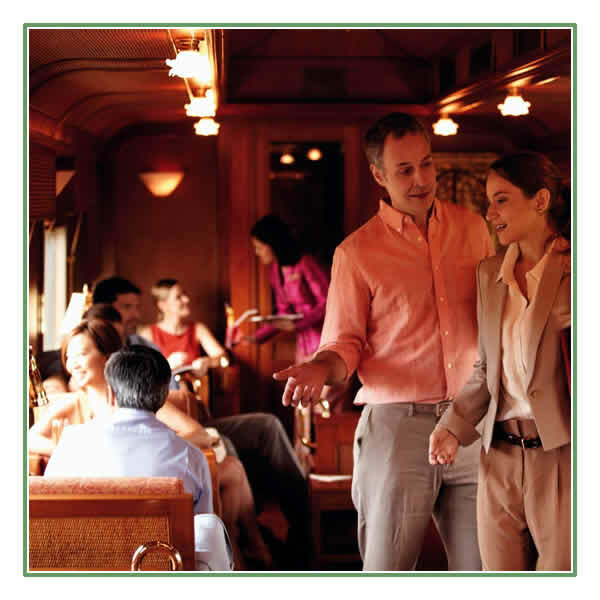 • Fare in a Pullman Superior compartment as appropriate and as shown in the itinerary. • All table d'hôte meals whilst on board. • Accommodation and buffet breakfast in a regular room at your hotel (unless indicated otherwise in the individual hotel descriptions). • All transfers throughout your holiday. Prices for single occupancy or single travellers on request (if not shown). All itineraries can be tailored to your own personal preference including your own combination from our selected hotels and our tour consultants will be pleased to advise prices. South East Asia contains some of the world's finest hotels in terms of standards and service. Certain hotels offer different grades of accommodation, some of which are available for a small supplement (details on request). Note that check-in / out time is usually between 12 noon and 14:00 and rooms cannot be guaranteed outside these times. If you are leaving late then please check with reception to see if you may keep your room a little longer. In any event the concierge will be able to store your luggage until departure. South East Asian Itineraries do not include flights from the UK to Bangkok or Singapore, unless specified otherwise. However, we are able to reserve flights with British Airways or Qantas from London Heathrow in World Traveller, World Traveller Plus, Club World or First. Due to the constant fluctuations in long haul flight prices these will be quoted at time of booking. Various itineraries have regional economy flights included. Unless indicated otherwise these are with Bangkok Airways. Should you wish to arrange these flights independently, a credit will be given. If flying to South East Asia with British Airways or Qantas, connecting flights to / from London are available from selected UK airports for a supplement . British Airways Club World and Qantas Business Class are available and prices are quoted at the time of booking to take advantage of the latest fares available. Note that upgrade supplements are based on business class fares at contracted rates and cannot be changed in any way once issued, unlike full fare business class tickets. Transfers are generally by private car, or in certain circumstances by mini-van. Customs regulations are in line with those prevailing elsewhere in the world, however the importation of prohibited items carries serious penalties. In particular the importation of narcotics into Thailand, Malaysia and Singapore is treated very seriously. The death penalty is still applied in certain cases on conviction. During your passage on the train, staff and agents of Eastern & Oriental Express will provide assistance to facilitate border formalities. You will be required to provide relevant information and hand over your passport at the appropriate times. Please note, however, that it is the responsibility of each individual passenger to ensure that he is in possession of any necessary and valid documentation and the Company assumes no responsibility for the consequences of any failure to comply. The Singapore Customs and Immigration facility is based at Woodlands next to the causeway to Malaysia. The E&O stops at this facility and passengers must disembark and pass through Customs and Immigration. Passengers must take their all hand baggage with them, while their main luggage is taken off for security screening procedures. Passport and customs formalities take place at the Malaysian/Thai border. Passengers will not normally be disturbed during the journey. Passports will be held during the journey by the stewards and will be returned immediately prior to disembarking. Check that your passport has at least 6 months remaining validity at time of travel. Aboard the Eastern & Oriental Express your steward will request your passport and ask you to complete immigration and customs documents. Passport and customs formalities take place at the Malaysian/Thai border and upon boarding or disembarking at Singapore. You will not normally be disturbed during your journey and your passport will be returned to you immediately prior to disembarking. Passengers boarding in Singapore and Bangkok are advised that the refund on Goods and Services Tax is only available at the Airport and not at the Railway Station. Visas for tourism visits to Thailand, Malaysia and Singapore are not normally required for stays of less than 30 days, except for nationals of certain Middle Eastern, African and South American countries. Visas may be required for onward travel to other Asian destinations. If you require a visa for a particular country, a visa will still be required even if in transit through that country. It is not possible to obtain visas on board the train or at the respective border points for entry into Singapore, Malaysia or Thailand. Therefore, those nationalities that do require visas for entry into any of these countries must obtain the correct documentation before boarding the Eastern & Oriental Express. Visa enquiries/applications should clearly state that the applicant will travel by rail. Passengers on the Vientiane programme require an entry visa for Laos. For passengers boarding the train at Bangkok, 2 passport-sized photographs are required upon check-in at Bangkok's Hualampong Station in order for the visa application to be processed. Regulations can change and it is the responsibility of the traveller to check that they have all the appropriate documentation prior to travel. Further information can be found at https://www.worldtravelguide.net and further UK passport information can be found at www.ukpa.gov.uk. Any non UK nationals should check with the relevant Embassy for passport/visa regulations. Generally speaking, as South East Asia is tropical it is warm and humid most of the year, with the most pleasant temperatures, lowest humidity and least rainfall between November and March. However at other times when rainfall can be heavy, it is generally for short periods, which are followed by bright sunshine. The on board team will be pleased to arrange for special items to be available in your compartment. For example, flowers, a fruit basket or special cake. Please ask for details and prices.